Plywood is a sheet material manufactured from thin layers or 'plies' of wood veneer that are glued together with adjacent layers having their wood grain rotated up to 90 degrees to one another. It is an engineered wood from the family of manufactured boards which includes medium-density fibre board (MDF) and particle board (chipboard).
" Are you looking for Kitchen plywood?" Kitchen is more exposed to water and moisture, and so requires a sturdy material for its inside boxes. A little care in quality could benefit in keeping the kitchen damage-free for longer. Our product 'Kitchen Ply' is meant exclusively for kitchen cabinetry making. This plywood is laminated with white mica on both sides and hot pressed with premium quality imported veneer, which resists borer and other insect attacks. The glue used is high quality Phenolic resin, which is mixed with other special chemicals to prevent insect attack. We developed this kitchen-friendly board after years of experience in this field and through research and information collected from technical experts from the industry. The white laminate finish gives the kitchen a neat look, and is easy to clean too. "Which plywood to buy? Confused ? There are different types of plywood available in the market. Often the house owner is not aware of the differences in quality, and also may not be involved in the buying process. Make sure you choose plywood according to the purpose it is required for. The plywood required for a cot, wardrobe, kitchen or paneling works may each be different and require its own characteristics. So be specific; if you are not using the right plywood it will affect the durability of the furniture. Wood is definitely of a superior quality but the choice should depend on the nature of work. All substitutes like plywood, MDF, particle board and other plastic and synthetic boards have its own properties and are suitable for specific interior and exterior works. For cabinets, plywood is the best choice as it is bonded, and does not bend easily. In plywood, veneers are dried and glued with grains running against one another and pressed in high pressure and temperature. There are usually an odd number of plies, so that the sheet is balanced—this reduces warping. It reduces the tendency of wood to split when nailed at the edges; reduces expansion and shrinkage, providing improved dimensional stability; and makes the strength of the panel consistent across all directions. All these properties make plywood the better choice for cabinetry making and many such purposes. But all the aforesaid qualities will be affected if, a good quality plywood is not used. "Lot of brands and quality, I am confused?" There are many brands of plywood available in the market. The plywood quality is determined by the veneer, glue, the hardness and the weight. The wood veneer plays a major role in the quality as using lighter wood will cause borer and insect attack, and lead to warping too. Screw holding capacity also will be less. The glue also plays an important role; if cheaper glues are used, the plywood gets delaminated very fast. So, an ordinary man can determine the plywood quality by the colour of the plywood and its weight. Dark colour veneers are normally semi hard or hardwood. Gurjan plywood is considered to be the best plywood in this respect. Its inherent oil content prevent borers, too. "What is laminated plywood? What is it used for?" Plywood that is machined pressed with high pressure laminate is called Laminated Plywood. This makes plywood more resistant to moisture and fungus. 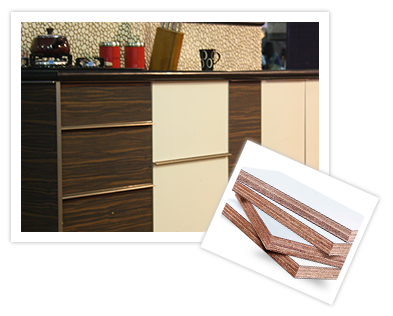 Laminated plywood is easy to work with for works such as kitchen cabinets, wardrobes, crockery units, book shelves, etc. This gives a clean and neat finish and is more durable than furniture made with plywood and HPL sheets manually glued on it.
" I need Wardrobe plywood." We tailor make plywood for various furniture requirements and customer preferences. Wardrobe plywood from Kelachandra can be taken from Marine Platinum Grade, laminated with High Pressure Laminate or Veneer as required. This plywood would definitely suit your requirements. We recommend Kelachandra Marine Platinum Grade or Gold Grade laminated with High Pressure Laminate or Veneer from our different plywood grades. These plywoods are generally used in homes to make furniture, where strength and quality is really important. Why many renowned Architects and Interior designers recommend our plywood? We, Kelachandra Plywood Industries, have been in the plywood manufacturing field for the past 30 years. Over the years we have understood that if you really want to offer specific plywood for specific purposes, mass production is not possible. Hence, we manufacture plywood based on individual customer requirements. Many of our customers are well known architects and interior designers and they are very particular about product quality and specifications. There is always decorative plywood for paneling works. Decorative plywood is the ply which is laminated with different species of veneer. The veneer can be of any wood namely Teak, Walnut, Wenge, Oak, etc sliced to .5mm thickness to give it the properties and finish of wood. This type of Decorative Plywood is commonly used for interior works, where you want wood finishes like paneling the wall or door way.